Texas has more wind capacity than any other state in the United States. This summer shows just how little that matters. Due to the fact that wind rarely blows when it is most needed, Texas wind capacity did little to abate the heat wave that struck Texas this summer. The state had to ready 4 natural gas-fired units that had been mothballed to compensate for the lack of wind. Making the electricity situation worse, the state is facing new regulations from the Environmental Protection Agency (EPA) that could take 8 coal-fired units off-line. That means that Texas residents must hope for cooler weather and/or windy days during future summers, or the state’s electricity consumers could be faced with brown outs and black outs. Texas has 10,135 megawatts of wind capacity, almost 3 times more than Iowa, the state ranking second in wind capacity. [i] In Texas, wind represents about 10 percent of the total generating capacity of 103,037 megawatts. [ii] But there is a big difference between wind capacity and actual generation. The Electric Reliability Council of Texas (ERCOT) counts only 8.7 percent of wind nameplate capacity as dependable capacity at peak periods of electricity demand. [iii] Unfortunately, wind blows more during the evening and night hours, when most consumers are asleep than when it is needed most during the day. 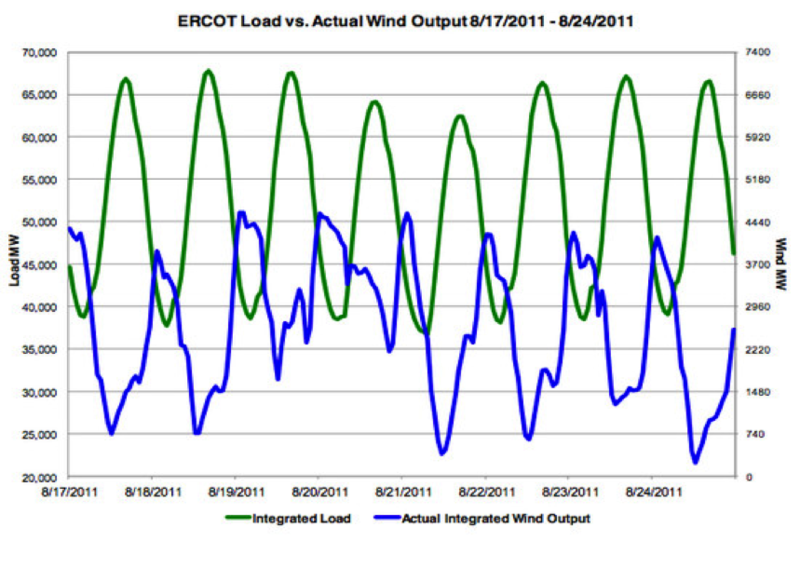 The graph below shows ERCOT’s demand load compared to wind generated in ERCOT between August 17 and August 24, 2011. Texas initiated a renewable electricity mandate in 1999, requiring 2,000 megawatts of renewable capacity be built by 2009. That was followed by other targets including 10,000 megawatts of renewable capacity by 2025. [ix] Those mandates created an environment of massive wind turbine construction where Texas now has almost 3 times more wind capacity than any other state in the United States. Unfortunately, that wind capacity does not come with much capacity value since it cannot be relied on to generate electricity when needed at peak demand. And, that wind capacity is going to require additional transmission lines to get it from distant areas to consumers in urban areas. Current estimates have the additional transmission costing electricity consumers in the state about $270 each. To add to Texas’ problems, the EPA now wants it to make 8 coal-fired plants comply with its Cross-State Air Pollution Rule. That means adding equipment or shuttering coal-fired plants in just 5 short months from notification. Obviously, either EPA does not keep up with the energy news and Texas’ generation problems or else the agency just does not care about the comfort of U.S. citizens and the success of the state’s industrial complex.